The Sealab undersea habitats were groundbreaking experiments conducted by the Navy between 1964 and 1969. Navy scientist Dr. George F. Bond developed and led the Sealab projects to test and demonstrate the concept of saturation diving. Bond’s experiments with saturation diving were born from a desire to improve the length and efficiency of deep sea dives. While divers work underwater, their body tissues fill with atmospheric gases that can cause decompression sickness if they do not allow the gases to safely leave their tissues through decompression. Divers using surface-supplied breathing systems often had to spend many hours decompressing after only minutes of bottom work time. Bond postulated that after 24 hours at a particular depth, a diver’s tissues would saturate with atmospheric gases, capping the amount of decompression time the diver required. Divers could thus remain underwater for days or weeks and still decompress for the same amount of time. Bond proposed the idea of saturation diving in 1957 and conducted a series of laboratory experiments over the next six years to establish gas mixtures and decompression schedules. These controlled experiments culminated with Project Genesis, which applied Bond’s findings to human subjects. The next step was to demonstrate the viability of saturation diving in a non-controlled environment. Under Bond’s supervision, in July 1964 four aquanauts spent nine days at 192 feet living in and working from Sealab I off the coast of Bermuda. The divers conducted extensive oceanographic research, returning to the pressurized 40’ by 9’habitat between tasks, before an approaching hurricane truncated the exercise. The success of Sealab I established saturation diving as an efficient method of working underwater. 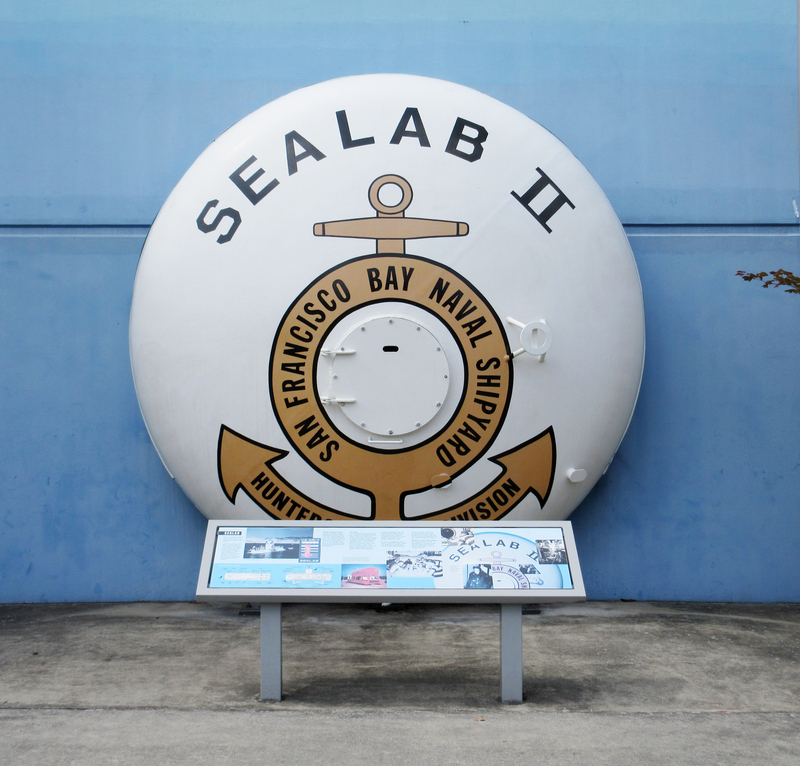 Sealab II was designed and built at Hunter’s Point Naval Shipyard in San Francisco. Fifty feet long with a 12-foot diameter, it contained four separate areas: an entry, a laboratory, a galley, and living spaces. 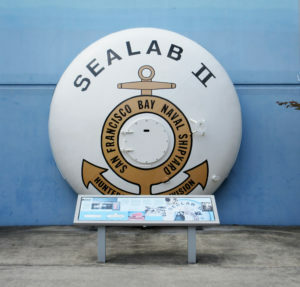 The redesigned exterior of Sealab II featured two end bells that were fashioned through explosive metal shaping, a very technologically advanced method at the time. After a one-inch thick piece of flat steel was placed over the concave side of a dome-shaped die, one hundred pounds of C-4 plastic explosive were attached to the steel. The C-4 was detonated at 30 feet underwater in the San Francisco Bay, forming each end bell in 0.004 seconds. Sealab II was designed to work at a similar depth as the first Sealab, but extended length of the aquanauts’ stay and expanded the type of work they performed. Between August 28 and October 14, 1965, three teams of ten divers spent 15 days each at 205 feet off the coast of La Jolla, California. Aquanauts tested underwater tools, raised a sunken fighter jet, conducted geological studies, set up a weather station, and worked with a porpoise trained to carry tools and messages between the habitat and the surface. for 600 feet, the habitat was lowered to the ocean floor off San Clemente, California, in February 1969. The project came to an abrupt halt after experienced aquanaut Berry Cannon died of carbon dioxide asphyxiation while repairing a helium leak underwater. The tragedy put a swift end to Sealab III and other saturation diving experiments. to advance saturation diving techniques through ongoing research programs at the Navy Experimental Diving Unit and the Navy Submarine Medical Research Laboratory.